Can't make it to the library? Let it come to you! 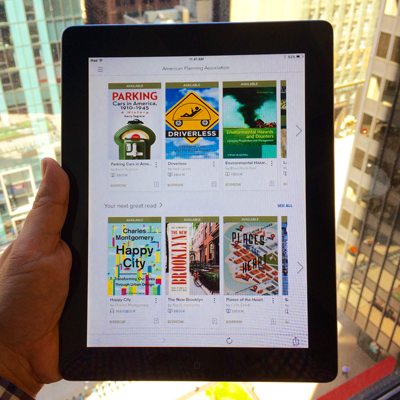 The American Planning Association Library E-book Collection was developed to give APA members online access to a collection of hundreds of e-books that are instantly accessible from anywhere in the world. To celebrate the 100th anniversary of the American planning movement, APA created a list of books essential to planning. These books come from every decade starting in 1909, the date of the first national planning conference. The American Planning Association Library Classification Scheme was created to meet the needs of today's practicing planners. The scheme focuses specifically on planning and provides a level of practical detail not found in other published systems such as Library of Congress or Dewey Decimal. APA maintains an institutional archive at Cornell University. Items pertaining to APA's organizational history — including the history of the two predecessor organizations — AIP and ASPO. Looking to schedule a visit or ask a general question about the library? Contact the librarian at library@planning.org.